Tupperware, Glad or other brand plastic food storage containers are made from different types of plastics and have different handling instructions. Look to see which number (from 1 to 7) the container has, and then recycle according to that number. Learn more about plastics #1, #2, #3, #4, #5, #6 and #7. All plastics contain harmful chemicals that can leach into your food when they’re heated. 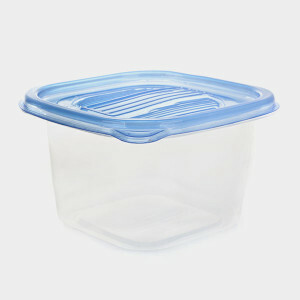 Before reheating food in a microwave, transfer it from a plastic container to a plate or glass dish. Don’t put plastics in the dishwasher, which uses hot water and steam, wash them by hand with lukewarm water instead. Cut down on your plastic food storage containers by purchasing glass or ceramic food containers, which last longer than the plastic ones. Furthermore, glass and ceramic containers can be microwaved more safely than plastic containers, and you can put them in your dishwasher. Buy plastic food containers that are durable instead of flimsy ones that will need to be thrown out soon after you buy them. Tupperware offers a lifetime guarantee and will replace broken or damaged items for free, and there’s also Sistema, which makes durable, BPA-free plastic food storage containers. According to National Geographic’s The Green Guide, plastics #2, #4 and #5 are the safest for repeatedly storing your food. If you reuse items made from plastics #1, #3, #6 and #7 (some Tupperware products are made from #7), you run the risk of having toxic chemicals leach into the contents.